Panasonic PT-AE3000 review | What Hi-Fi? 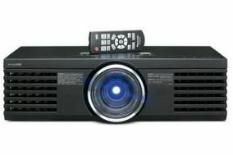 One of the most popular questions we're asked, whether on the forums at whathifi.com or at shows around the country, is "should I buy a projector or a new television set?" Normally a large TV is seen as an alternative to a projector – a top-notch 46 or 50in set would be in the same price bracket. But when you see this Panasonic in action it's a good reminder that a TV, no matter how good, really can't match the home cinema experience that a projector delivers. What's more, this is probably the easiest projector to set up that we've ever come across. That means we're enjoying the brilliant images quicker than you can say 1920 x 1080 resolution (this LCD projector has that under its bonnet, too). Two click-wheel style controls atop the projector give you total control of the image. One allows you to shift the projector left and right, and up and down, the other gives you access to the powered zoom and focus controls. In a matter of seconds, we're in business. Along with the necessary 1080p resolution and easy set-up, there's not a great deal more for a projector to worry about in terms of specifications. It has three HDMI inputs, Panasonic's 100Hz motion processing and plenty of other picture adjustments, too. Also worth noting is that it's quiet in operation, although it does run fairly warm. Colours are full-bodied, bold and punchy where required, and the grime and sweat of the Mumbai slum is accurately conveyed thanks to muddy, deep browns and hot, luscious reds. Switch to the more natural, at times insipid, palette on the BD release of Gomorrah and the PT-AE3000 is equally adept at realistic skintones that pack in plenty of detail, ensuring the tough men, and indeed women, are given the appropriate definition. We chose 'mode 1' when it came to motion processing, to ensure a smooth but natural delivery. While upscaled DVD won't impress in the same way as HD, we have to rein in our expectations only a touch before we enjoy sharp, insightful, colourful pictures. So, a lesson: never judge a projector by its decidedly dull exterior. This Panasonic is a supremely clever and brilliantly capable piece of kit.